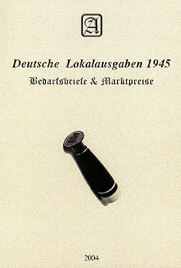 Book for all those collectors who are interested in entires of the German municipal issues of 1945. On the 183 pages of the book are shown 600 commercial covers in b&w and color. There are also shown some so-called Saxon Blackenings, cash frankings and a survey on the then postage rates. 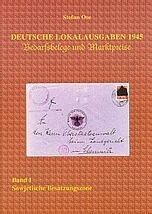 U.S. Zeitschrift "German Postal Specialist"
Bedarfsbriefe, Paketkarten und Postanweisungen frankiert mit der Ausgabe "Deutsche Lokalausgaben 1945". Sächsische Schwärzungen und Barfreimachungen zu den entsprechenden Gebieten. Beschreibungen sowie Auktionsausrufpreise und Auktionsergebnisse als marktgerechte Bewertung.